Confession time. I'm not very good to myself at breakfast. I'm rushed and distracted and I tend to eat a piece of toast standing up in the kitchen and then run. Oh, I'm better the rest of the day and I will eat fruit and vegetables and yogurt before it's all done. But, seriously, what a piss-poor way to start the day. No more, though. I'm vowing to reform. I needed to find a breakfast that was packed with protein, which my toast was sorely lacking, included a good dose of fiber, was quick to make and reasonably portable. Because, let's be honest, I was probably going to eat it sitting at my desk and checking emails. And so I looked to my container of cottage cheese and the whopping 14 grams of protein in every serving. Check. Some granola for fiber and energy. Check. 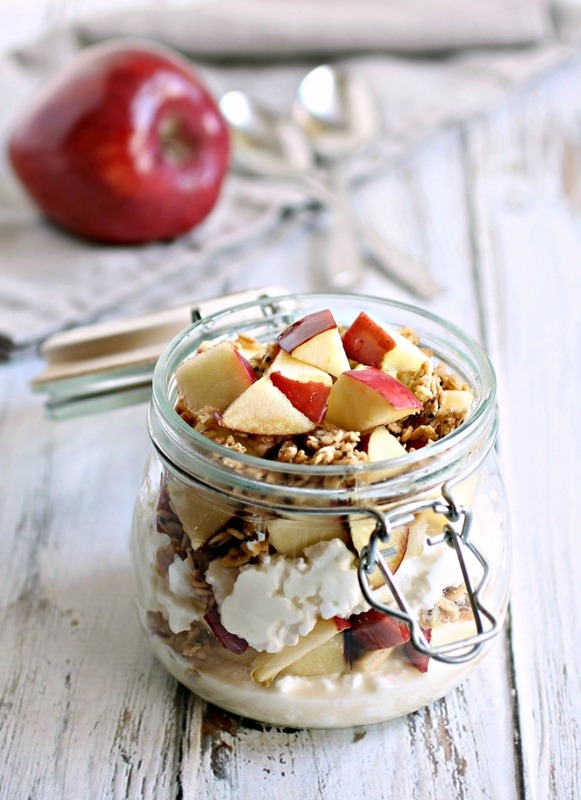 And my very favorite cottage cheese mix-in, an apple, for vitamins and sweetness. And in the time it normally takes for my bread to toast, I had all these ingredients layered into a jar and ready to go. What I especially liked, while I was eating it at my desk checking emails, is that I wasn't trying to get through it as fast as possible, like my toast. 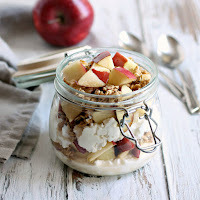 I really liked digging in and finding the bits of apple and little clusters that are in granola. This was fun. And healthy. And it kept me full till lunch. I'm a reformed woman. And I'm heading off to the market to stock up on my cottage cheese, granola and apples because this is definitely my new thing. Enjoy! Toss the apples in the maple syrup and sprinkle on the pinch of salt. Add the cottage cheese and granola and stir to combine. Do you like my idea for this mix-in? Maybe you have a better one? Friendship Dairies is running The Super-Duper Fantastic Superfood Mix-In Sweepstakes and they're giving away $5,000 in prizes including three Vitamix blenders valued at almost $500 each. 1. Use the Superfood Generator to select a cottage cheese. 2. Choose up to 3 mix-ins. 3. Get a Super Summary and enter the sweepstakes. This recipe was sponsored by Friendship Dairies but, as always, my opinions are my own. Thank you for supporting the products I love and use in my kitchen. Yum! 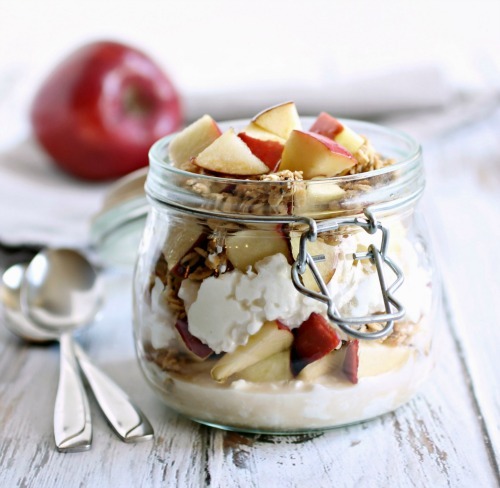 Great looking breakfast and great photos! 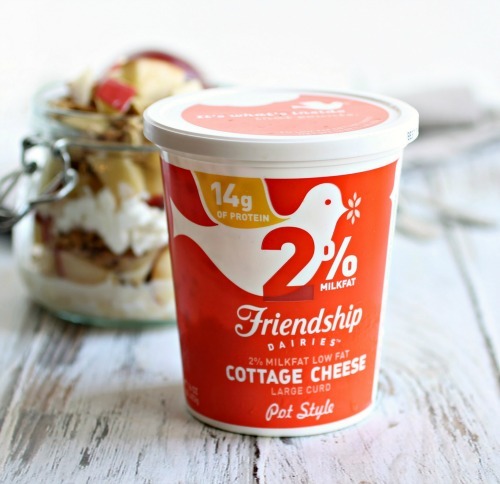 Have you ever tried IGA's cottage cheese? I test tasted them all and IGA's is by far the best imo and the price can't be beat..